Liam Neeson, Anna Kendrick, and Lin-Manuel Miranda audition to become Stephen Hawking's new voice. Stephen Hawking—the guy who made astrophysics cool before Neil deGrasse Tyson came along and started criticizing our favorite sci-fi films—has a familiar, unmistakable voice. It's the American-accented robotic voice that came with his "Equalizer" computer program, which he has been using to speak since 1986. In those last 30-plus years, Hawking has had many opportunities to change the inflection or tone or timbre of this electronic system, but has always declined. That could all easily change, however, as a new short film from Comic Relief revealed. 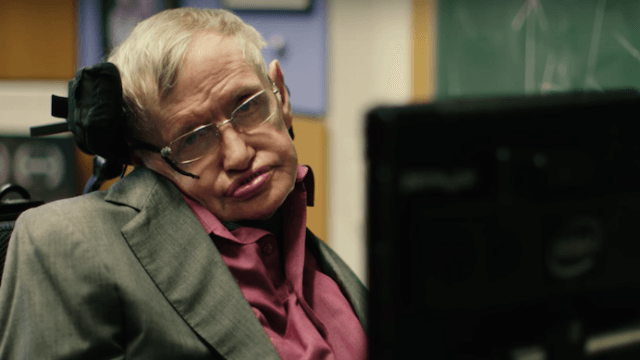 It seems that Hawking allowed a few celebrities to audition for the chance to be his new voice, and big names like Liam Neeson, Anna Kendrick, Rebel Wilson, and Lin-Manuel Miranda all came out to give it their best shot. Congrats to Stephen on his final choice! We've never heard anything like it.